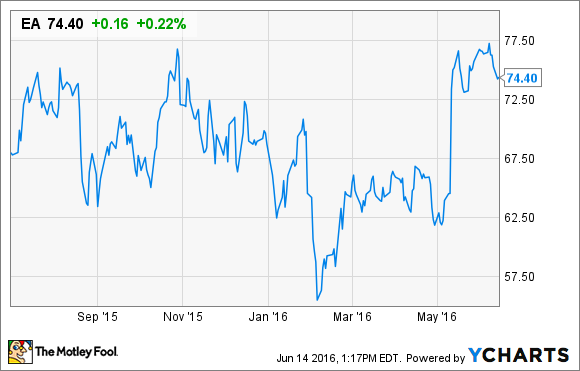 Is Electronic Arts Inc. Stock a Buy Right Now? The video game juggernaut posted another year of increasing profits. Is now the time for investors to act? For almost a year, shares of video game designer Electronic Arts (NASDAQ:EA) have traded sideways with little upward movement. This has happened despite another year of record sales and profits. Should investors stay away? Or are there plans in the works that could push the company's stock higher? Traditional video games have been under attack from disruptive companies and technologies entering the fray over the last decade. This has especially hurt console gaming, which historically was Electronic Arts' bread and butter. Console designers and manufacturers like Microsoft and Sony have been adamant that innovation can counteract the disruption. Speaking to the growing challenges ahead, Sony, maker of the PlayStation 4, asserted its confidence back in 2013 that console gaming could fight back with new features like streaming games and services, console-based apps, and upgraded technology. While other game developers have struggled, EA has stood out. Packaged video games accounted for virtually all of the company's sales just a few years ago, but during its last fiscal year, revenue from that segment accounted for only 45% of the top line. This underlines the company's success in diversifying its business during a time of transition in the broader industry. So what has Electronic Arts specifically done to keep up over the last few years? And can these initiatives propel the business higher? The advent of mobile games has proven to be difficult for many developers, but EA has navigated the change successfully. At the beginning of this decade, its mobile gaming business was nonexistent. However, as of the most recent earnings release, 12% of total revenue was derived from mobile platforms, totaling $570 million in the last year. The company has accomplished this feat with games developed in-house as well as acquisitions. Most notable among the acquisitions were the purchases of Chillingo in 2010 and PopCap Games in 2011. You may have heard about Chillingo and PopCap from your Angry Birds, Iron Force, Bejeweled, or Plants vs. Zombies addiction during your lunch break. EA has also developed mobile hits in-house like The Sims, with the latest installment of that franchise recently hitting 200 million downloads; Madden NFL Mobile; and a few new Star Wars mobile games that the company licenses from Disney. Together with its mobile developer acquisitions, EA has created a thriving app-based business based on in-game advertising, in-game purchases, and premium mobile games for purchase. The mobile division has increased 13% year-over-year and is expected to continue growing in the double digits going forward. The next generation of console video game platforms has been out for a couple of years now, and EA has capitalized on the new technology, which features improved graphics and performance, but that is only part of the story. The bigger benefits for EA in the latest generation of game platforms have been in cloud-based downloads. While packaged game sales are up only 4% in the last year, full-game downloads have increased 25% over the same period. This is significant, because the switch from physical purchases to downloads equates to a higher profit margin business for game developers, as manufacturing, packaging, and distribution costs are reduced. The ability to download extra content has also been a big hit, and the company's extra content revenue is up 20% over the last year. In addition to generating more sales, extra content helps extend the life of a game title. Players stay engaged longer if new features get added to the mix, which lessens the pressure on EA to quickly develop another big hit or full-feature new game to replace aging ones. Closely tied to the cloud-based business is the newer subscription-based gaming business. Revenue from this area still represents less than 8% of the topline, and year-over-year growth is flat, but the extra service might help offset drops in revenue when new game sales are weak. How does it work? The subscription service unlocks the social aspect of video games -- titles like the Battlefield franchise and Star Wars: Battlefront require a monthly subscription to play with other gamers online. Subscriptions in other games can also unlock extra content or features for players to use. The subscription service not only diversifies the revenue stream, but it also helps the company the same way as downloadable content: The service extends the life expectancy of titles as gamers stay engaged for longer, increasing game loyalty. As a result, this helps lower development and other overhead costs for Electronic Arts. As far as future projects go, the pipeline of new game releases and new content for existing games remains unchanged. The real story here is the company's continued migration to a digital business model that generates multiple revenue streams outside of the sales surge from a traditional game release. The transition to a digital model is powerful. While the company's sales in its last fiscal year decreased about 2.5%, the cost of those sales decreased even more, at a rate of over 5% from the previous year. This helped bottom line profits increase over 30%. Other irons in the fire include possibly game-changing virtual reality technology, further immersing players in the gaming experience and creating a new sales opportunity. The company also recently launched the EA Originals project, which seeks to fund a few small game developers each year and distribute their products to the public. Electronic Arts has developed into a gaming giant, and growth is expected to move at a much slower rate than in past years. Profits are expected to grow an average of about 15% for the next five years, compared with an average of 30% over the previous five. While 15% growth is still impressive, that deceleration is currently baked into share prices and is part of the reason shares have been roughly flat for almost a year. The company's one-year forward price-to-earnings ratio is at 18.5 times, and the five-year PEG ratio, a measure of price versus expected profit growth, is at 1.4. A PEG over 1.0 would typically indicate a company enjoys a premium valuation. With the video game industry in transition and no slam-dunk opportunities ahead for major business expansion, Electronic Arts' current share price is a little rich for my taste at this time. That being said, the stability of the company's sales in a challenging and competitive industry is enough to put the stock on my radar.